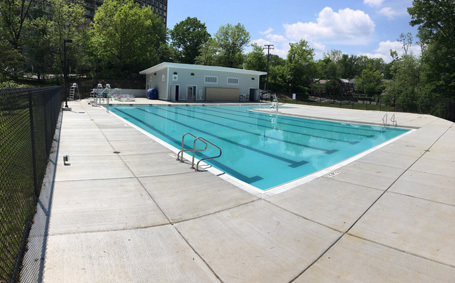 With the closing of two of their seven pools in 2011 due to increased operational costs, the City of Alexandria retained Counsilman-Hunsaker to develop an aquatic facilities strategic plan which outlined and prioritized the future aquatic needs of the community. Extensive demographic research along with industry benchmarking provided the city with the information needed to become a premier aquatic provider over the next 10 years. Pleased with the results from the study, the city demolished the existing Warwick Pool and chose to construct a new 4,200 sq. ft. outdoor leisure pool at Warwick Park. The original Warwick pool was built in the late 1950’s with multiple service repairs and upgrades occurring over the years. The city has operated the facility since 1978 but closed it in 2014 due to deficiencies affecting its safe and efficient operation.